By author: Dr. John W. Brinsfield, Jr., John W. Brinsfield Jr. Historians are only beginning to address the religious as a facet of the Civil War. Because neither war department had an office governing military chaplains, almost 4,000 of them were nearly lost to future study. After many years of research, their names, assignments, and denominational affiliations were listed in Faith in the Fight. In an organization created to destroy the enemy, chaplains ate, drank, and slept dissonance. Older than most soldiers and looking at battle with very different eyes, chaplains had their beliefs brutally tested at the same time they instilled faith that sustained men through adversities and tragedies. 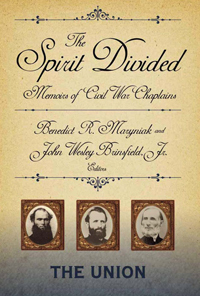 The Spirit Divided is a collection of letters, reports, and recollections in which army chaplains describe their motives and methods, their failures and achievements. Some threw away their somber black uniforms and became dashing staff officers who rode over battlefields to deliver orders, even capture enemy soldiers. Scorning these “chaplains militant,” others were, in the words of a battlefield journalist, “bearers of the cup of cold water and the word of good cheer—the strong regiment may be the colonel’s, but the wounded brigade is the chaplain’s.” Chaplains wondered whose side God was on, and if their ministries might be in vain. They saw, on both sides, God’s Spirit at work. Was the Spirit divided, was God punishing both North and South for their sins, or was there some other explanation for this seemingly endless war? The reflections of these men of the cloth, who were underfed, underpaid, and largely unappreciated, have much to teach modern readers. They had to find, above all, the faith and perseverance to sustain the spirit of their people during the greatest war ever fought on this continent.